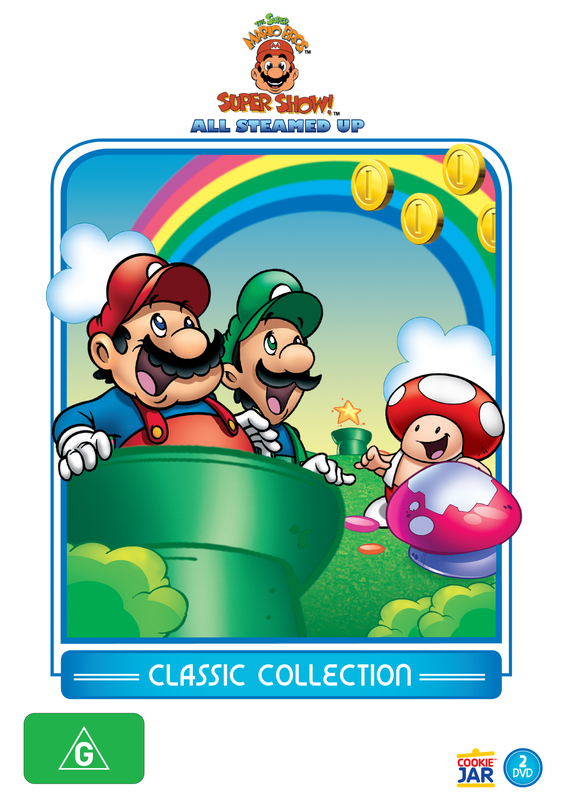 The Super Mario Bros. Super Show All Steamed Up Classic Collection is a collection of episodes from the Super Mario Bros. Super Show series that aired back in the 80s. 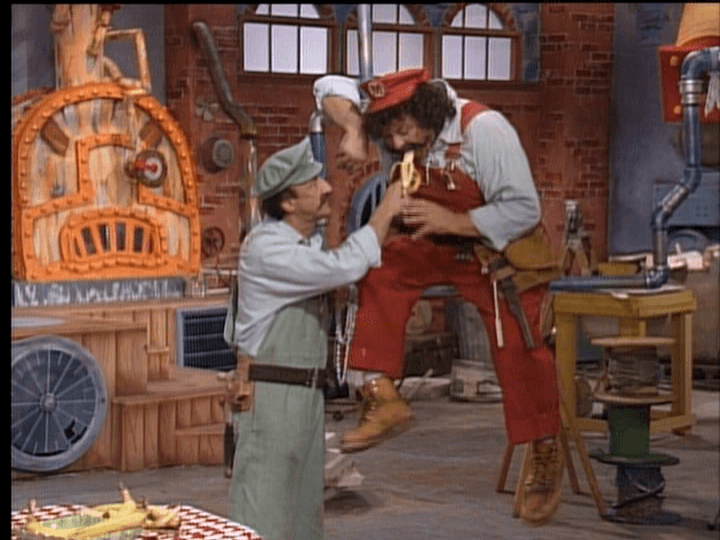 It stars Lou Albano and Danny Wells as the main characters Mario and Luigi. The series is a kind of hybrid of live-action sequences and animated episodes sponged together to make an entertaining show. The show is also based on a video game series, Super Mario Bros., and adapts Mario and Luigi’s adventure in a different medium. Does this work? Read on to find out. 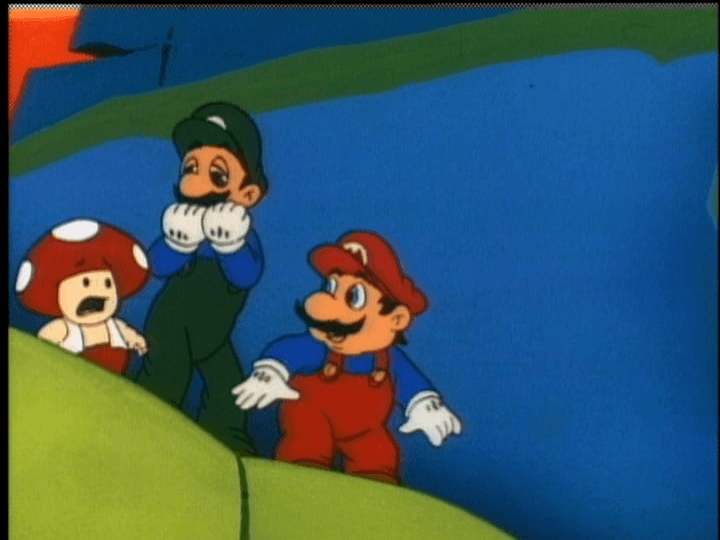 The Super Mario Bros. Super show is one part live action shorts and another part 20-minute animated episodes combined together to make a complete series. Much like most cartoons from before the 90s, the series doesn’t have all that much continuity between episodes, making it an adventure of the week kind of deal. The way each episode lays out is there will be a live-action opening sequence and a live-action story that will generally involve some kind of guest-star getting into some kind of shenanigans that will have to wait to be resolved by the end of the episode. After this live-action opening story, there will be a cut to an animated opening and then there will be a 20ish-minute animated episode involving Mario, Luigi and various other characters from Super Mario lore. Finally, towards the conclusion of the episode, it will cut back into the live-action story and resolve that before cutting to the credits. I’m not entirely sure why, but to me the series didn’t really feel like it was connected between episodes. I’m not sure if it should have or not, but there was this overwhelming sense of discontinuity from the series. For instance, in one episode they might be in World 7, and in the next they will have almost travelled across 10 more worlds. If I recall correctly, in the games each world was pretty interesting, so I don’t see why we should have missed out on all of these extra adventures. One of the best parts of this series is the overly cliched Italian-American dialogue. A lot of people will probably disagree with me here and will say that it’s really bad and not one of the best things of the series. But really, to me anyway, I felt that it was so bad that it was good. Although I will mention that there are too many pasta mentions in the show; and why does Princess Toadstool sound like an Italian-American? What was really strange for me was that some of the enemies didn’t behave the way I would have figured their characters would have behaved from what I could perceive from the games. This is fine though, as it adds a new dimension to some creatures that I didn’t think existed. I actually really quite enjoyed the visual quality of the series. In my opinion the animation has aged pretty okay in comparison to other animated works that are very near impossible to watch today, when compared to the past. However, I have to say that the live-action film bits do look a little dodgy compared to the animation and shows of today. 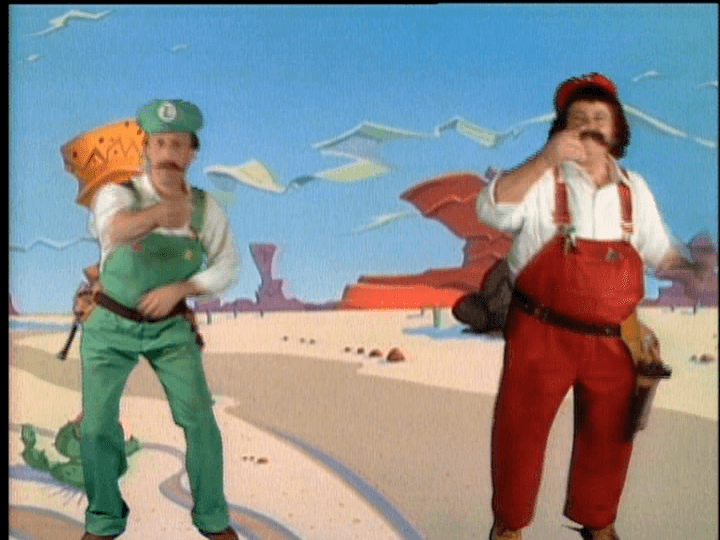 The one thing that I absolutely love about the Super Mario Bros. Super Show is the live-action opening sequence of Mario and Luigi. 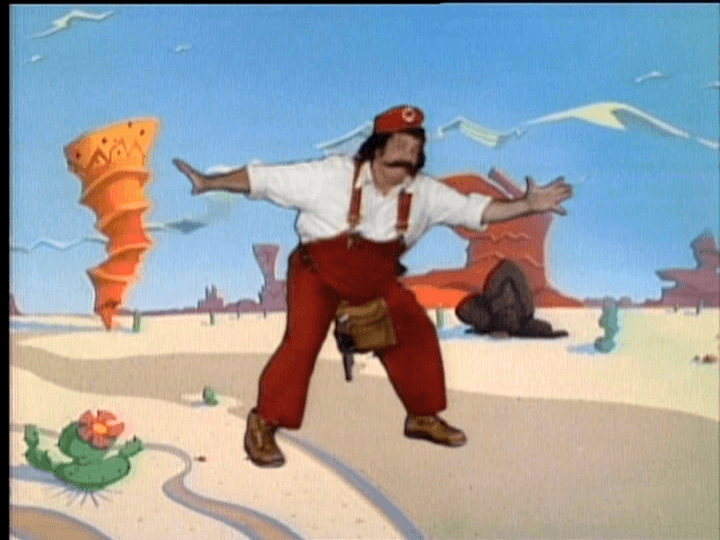 For some reason, having the the real-life actors performing while having the opening song playing in the background is just really awesome to watch and when it’s coupled with the ending of Captain Lou (Mario) ‘doing the Mario’, it’s just amazing. In my opinion, this show is worth the purchase just for the opening and endings. The characters resemble their game-versions quite well, which I largely attribute the success of this show to. I also like how each episode has it’s own look and feel, much like each level in the video games. 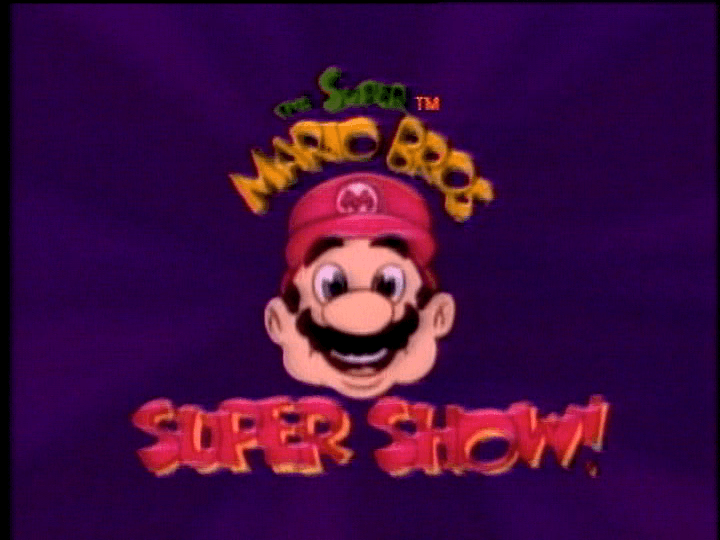 The most awesomest thing about the Super Mario Bros. Super show is the opening and ending sequence’s audio. I mean seriously, a rap song about the Super Mario Brothers? A hilarious ending track involving a dance called ‘The Mario’? How is it that things from before my time are way cooler than the things from after my time. For reference, my childhood was super-awesome and counts as before my time. What is also really cool about the Super Mario Bros. Super Show is that the series lifts sound effects and background audio from the games, making the show tonnes more authentic and way more entertaining to watch. Seriously, this is like one of the greatest things ever about the show, I think that a blind person could even have fun watching this. However, as I stated in my story section, the dubbing is very Italian-American. It also heavily references things like pasta and other cliched Italian cliches. However, I don’t feel that this is detrimental to the show, even if it does seem incredibly corny. Unfortunately, I could not find any additional features or extras on the discs. However, with such a classic and possibly obscure series, it’s amazing that they’ve even gotten the episodes back and in working order. So, unless you count a Spanish track as an extra, I’m afraid there isn’t really any that I could find. I don’t feel that this lessens the value of the package, considering it’s not like it was something that was withheld from us. It’s just something that probably never existed in the first place. 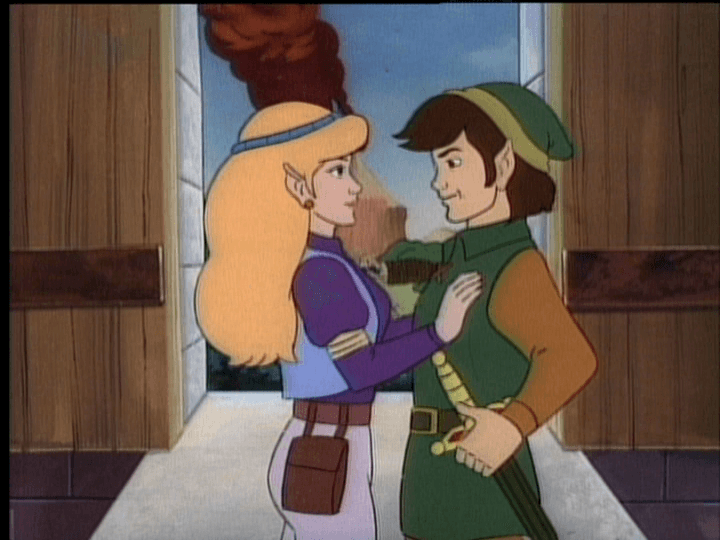 Although, conversely to this, I do feel cheated out of The Legend of Zelda Show, considering it is promoted in every single episode on these two discs. The Super Mario Bros. Super Show All Steamed Up Classic Collection is an excellent package for fans of classic animation and video games. As a show, the series is quite entertaining and is very easy to watch. As a package, the show is an excellent investment and a great addition to anyone’s collection of video games and video game themed items. I would definitely advise everyone to pick this up, either for themselves, or their kids as soon as they can. This is because of the reasons that I have listed in the review and I believe that is an excellent series.